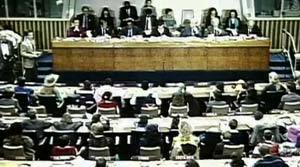 On the 20 November 1989, on behalf of the Social and voluntary Commission, the General meeting of the United Nations adopts the Convention on the Rights of the Child and opens it with the signature, the ratification and the States admission. The text of the Convention (54 articles) was adopted in New York, by acclamation (without vote), unanimously of the member States of the United Nations, in resolution 44/25. The year 1989 is symbolic because it is the year of the 30 anniversary of the Children Rights Declaration and the 10 anniversary of the international year of children. The text of the Convention of 1989 goes further than the Declaration of 1959 : it includes new rights and recognizes for the first time the Children as subject to rights.